PPC is a mode of Advertising your services on Search Engines (for certain keywords) as well as Social Platforms by paying a specific amount of sum on the basis of number of visits/views. You can choose any keywords for which you want to show your ad copy targeting exactly the services you offer. PPC platforms are offered by many of the high traffic sources like Google Adwords, Yahoo Search marketing, MSN Adcentre, Facebook, Bidvertiser, Miva, 7Search, ABCSearch. 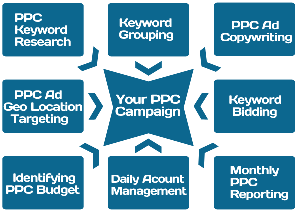 PPC Campaign Set Up – Initial account creation. PPC Campaign Optimization – Optimizing the account for best performance. At KK-WebServices, SEO Agency in Panchkula (India) we research and closely analyze the ever changing search trends by creating test cases. We keep our self updated and build a strong understanding of how to utilize various web platforms to get our clients ahead of competition. Our expertise lies in delivering a better search engine friendly website, managing closely knit paid ad campaigns and maintaining social brand reputation for your business.